Achtung! 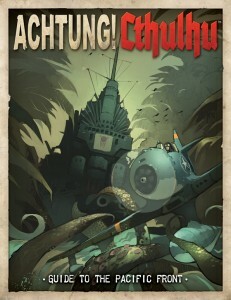 Cthulhu is a terrifying World War Two setting, fully compatible with the Call of Cthulhu, Sixth Edition and Savage Worlds roleplaying games. In fact, a whole dossier’s worth of useful historical and fantastical information to help you expand your campaign out into the wider world of the Secret War. Stats and rules for use with BOTH Call of Cthulhu 6th Edition AND Savage Worlds in one book! Requires the Call of Cthulhu 6th Edition or Savage Worlds Rulebooks to play. This is a supplement for use with the Achtung! Cthulhu: Investigator’s and Keeper’s Guides. To order a PDF of this book, click HERE.